Our solar system hosts a cornucopia of worlds, from the hellfire of Venus to the frozen plains of Mars to the mighty winds of Uranus. In that range, the Earth stands alone, with no planet coming close to its life-friendly position near the Sun. Outside our solar system, however, it's a different story. Observations using space-based and ground-based telescopes have indicated that a new class of objects dubbed super-Earths – worlds that are about two to 10 times our planet's mass and up to two times its radius – could be among the most common type of planets orbiting other stars. Artist's impression of the Gliese 667C system. Scientists also believe that these smaller stars are the most abundant in the Sun's corner of the universe, implying super-Earths would be plentiful in our solar neighbourhood, as well. Nader Haghighipour is a member of the NASA Astrobiology Institute and the University of Hawaii-Manoa's Institute for Astronomy. Among his research interests is figuring out how these worlds form, and most importantly, how they arrive in their current orbits. Some of his work hints that migrating giant planets could be responsible for the close-in orbits of smaller bodies. Their massive gravity could excite the rocks and protoplanetary debris on their paths and cause them to be scattered out of the system or coalesce into smaller planets such as super-Earths. "When giant planets approach the central star, especially around an M-dwarf, I'm interested in how they affect accretion of small planetesimals in a disc in front of them and how that will result in the formation of super-Earths, particularly in the habitable zone," Haghighipour said. 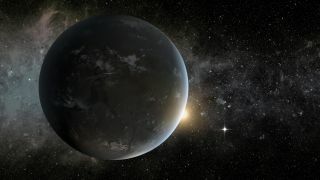 Haghighipour recently surveyed the state of super-Earth research in a paper that appeared in the Annual Review of Earth and Planetary Sciences. The first super-Earths were discovered in 1992 around pulsar star PSR B1257+12, but it's only in the past five years that the pace of discovery picked up. This was in large part due to the arrival of the NASA Kepler space telescope, which spent close to four years hunting planets in a small region of the sky in the constellation Cygnus. Kepler ended its primary mission in 2013 after the telescope exceeded its design lifetime. During this time, it provided a treasure trove of extremely high quality data that has revolutionized the field of exoplanetary science. Short period super-Earths are easier to detect around smaller stars than those that are the Sun's size or larger. This is because smaller stars show larger reactions to the tug of the planet as the planet orbits the star. If the planet happens to go across the face of the star from Earth's perspective, a super-Earth blocks out more of a small star's light, making it easier to detect. "That super-Earths in short-period orbits around cooler and smaller stars are easier to detect has set the ground for this becoming fashionable, and now there's a great deal of attention in using radial velocity and transit photometry techniques to find such planets in the habitable zones of M stars," Haghighipour said. While NASA scientists re-examine Kepler's mission – its science work is on hold after two of its four reaction wheels failed – they are hard at work planning its successor mission, the Transiting Exoplanet Survey Satellite (TESS). TESS will have both advantages and disadvantages while searching for super-Earths, Haghighipour said. Earth seen from the NASA Mercury MESSENGER spacecraft. Astronomers are not sure if super-Earths have tectonic plates or an atmosphere that is similar to our own planet. "Because TESS is going to cover the entire sky, as opposed to Kepler that focused on only one portion of the sky, it may be able to find more [exoplanets]," he said. "As far as accuracy and precision, because it’s not going to stay on one region of the sky for as long as the Kepler did, the accuracy may not be as high as that of the Kepler." One particular star system of interest to Haghighipour is Gliese 667, a triple star system which lies about 22 light-years from Earth. Haghighipour was part of a team that identified at least one super-Earth in the habitable zone of GJ 667C in 2012. Because the star is so faint and dim, to be in its habitable zone these planets must crowd in close. The researchers estimated that the planets have very short years, between 20 and 50 days, and may even have one side perpetually facing their host star. Even in this state, however, the astronomers believe it is possible that life could survive there. "It's the most reliable detection [of potentially habitable exoplanets] that we’ve had," Haghighipour said. The challenge, he added, is to understand the planets' habitable environments from a distance. While calculating the location of the habitable zone of a star is relatively straightforward, modelling the planets' dynamics and climate is far trickier. It is unknown if these worlds have plate tectonics, for example – a geophysical processes that regulates the abundance of CO2 and H2O in Earth’s atmosphere. Their interiors remain masked to astronomers, and understanding exoplanet atmosphere composition is something that some teams are only starting to accomplish. The field of stars that the Kepler space telescope examined as it searched for exoplanets. Identification efforts continue, however. Haghighipour has been working on detecting super-Earths in the habitable zones of M-stars since 2009 along with observers at the University of California, Santa Cruz and the Carnegie Institution of Washington. Gliese 667Cc is the most cited discovery from this collaboration, but there are others. On the theoretical side, Haghighipour has two papers published in the Astrophysical Journalabout habitability in binary star systems. He also has been trying to figure out how super-Earths form at different distances from their stars. "It's possible each system has had its own history, and its own way of formation. There is no reason to believe that one way of formation for planets in a system, or for super-Earths in habitable zones, can be applied to all systems," he said. Perhaps this research could shed some light on the formation of our own solar system. Both super-Earths and "hot Jupiters" – gas giant planets that closely orbit their parent stars – appear to be common in other systems, so why not ours? "Honestly, we have no definite answer for that. There are many different models that present different ideas for why there are no super-Earths and hot Jupiters in our solar system. But in order for these models to be successful, they have to explain other properties of the solar system as well," he said. For example, a giant gas planet close to our Sun would likely have disturbed any rocky planets wanting to orbit nearby. It will be an interesting theoretical puzzle for astronomers to figure out as they continue classifying worlds outside of the solar system.